Researchers led by Keigo Kamata and Michikazu Hara of Tokyo Institute of Technology (Tokyo Tech) have developed a ruthenium-based perovskite catalyst that shows strong activity even at low temperatures (down to 313 K). The reusable catalyst does not require additives, meaning that it can prevent the formation of toxic by-products. The oxidation of sulfides is a commercially important process with broad applications ranging from chemicals production to environmental management. The researchers succeeded in developing a barium ruthenate (BaRuO3) perovskite—the first catalyst of its kind shown to be capable of the selective oxidation of sulfides under mild conditions, with molecular oxygen (O2) as the only oxidant and without the need for additives. Reporting their findings in ACS Applied Materials & Interfaces, the researchers state that BaRuO3 has three advantages over conventional catalysts. Firstly, it exhibits high performance even at 313 K, a temperature much lower than the 373 to 423 K range reported in previous systems including other ruthenium- and manganese-based catalysts. Secondly, its high rate of oxygen transfer indicates that it has many potential uses; for example, it is applicable to the oxidative desulfurization of dibenzothiophene, which can produce a 99 percent yield of pure sulfone. Thirdly, the new catalyst is recyclable—the present study showed that BaRuO3 could be reused at least three times without loss of performance. The achievement overcomes several classic limitations, such as the need for additives, toxic reagents and high reaction temperatures to achieve good catalytic performance. The catalyst has a rhombohedral structure (see Figure 1). 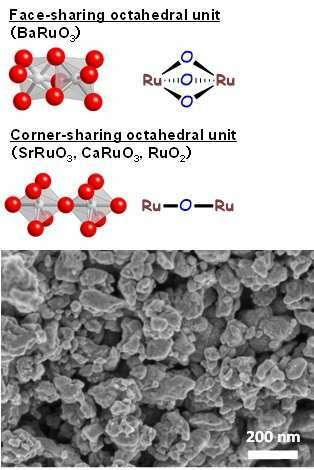 While other ruthenium-based catalysts investigated to date such as SrRuO3, CaRuO3 and RuO2 can all be described as having corner-sharing octahedral units, BaRuO3 has face-sharing octahedra. This configuration is thought to be one of the main reasons behind the catalyst's higher oxygen transfer capability. The way in which BaRuO3 was synthesized—based on the sol-gel method using malic acid—was also important. The researchers say: "The catalytic activity and specific surface area of BaRuO3 synthesized by the malic acid-aided method were higher than those of BaRuO3 synthesized by the polymerized complex method." The study highlights the importance of subtle changes in the nanoscale structure of perovskite catalysts, and could provide promising leads for further research on a wide range of perovskite-based functional materials.